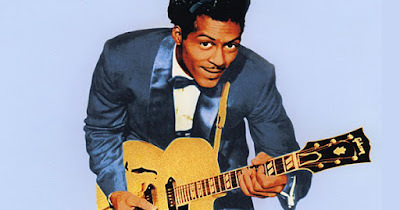 Music Legend Chuck Berry Did, In Fact, Invent Rock ‘N’ Roll -- Not Elvis Presley or the Beatles! Chuck Berry was an African American singer, songwriter, musician, and one of the original pioneers of rock and roll music. But he was more than just a pioneer of this popular music genre... He invented it! Even Billboard magazine agrees that if it wasn't for Chuck Berry, rock and roll music would not even exist... or at least would not be the same! Born in 1926 into a middle-class family in St. Louis, Berry took an interest in music at a very early age and reportedly made his first public performance while in high school. By 1955, he had recorded "Maybellene" - an adaptation of the country song "Ida Red" - which quickly became the #1 song in the country and went on to sell over a million copies. By the 1960's, Berry was already a super star with several hit records under his belt, appearances in major films, and a nationwide tours that were easily selling out. He even established his very own nightclub in his hometown called Berry's Club Bandstand. In 1986, Berry was among the first musicians to be inducted into the Rock and Roll Hall of Fame. During the ceremony, he was cited for having "laid the groundwork for not only a rock and roll sound but a rock and roll stance." In many different issues, Rolling Stone magazine included him on the "greatest of all time" lists, and ranked him #5 on their 2004 and 2011 published list of the 100 Greatest Artists of All Time. His all-time hit songs include "Maybellene", "Rock and Roll Music", "Sweet Little 16", "School Day", and everyone's favorite "Johnny B. Goode" - which is the only rock-and-roll song included on the Voyager Golden Record. When he turned 90 years old, Berry announced that he’d soon go on the road to support his first new album in 38 years. However, he died shortly after making that announcement. His fans were disappointed that he didn't get to go on what would have been his last tour, but his legend continues to live on through the music contributions he made as the king, the godfather, and the inventor of rock and roll music!